Symbols began to appear on certain Chinese coins starting about 2,000 years ago. At first, these were very simple symbols such as raised dots and raised crescent-shaped lines. The Chinese refer to these as "stars" and "moons", respectively. The symbols gradually became a little more complex and and began to include irregular round-shaped forms, known as "clouds" or "auspicious clouds". Finally, wiggly lines became known as "dragons" such as can be seen on the old Chinese charm on the left. You can see more examples of old charms with stars, moons and clouds at Emergence of Chinese Charms and Ancient Chinese Coins with Charm Features. 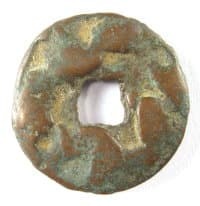 There have been a number of theories as to the meaning of these symbols and as to why they appeared on Chinese coins For example, the most popular explanation for the appearance of "moons" was that they were made by a person (usually said to be an Empress or some other famous personage) impressing their fingernail into the clay coin mold before it had dried. This would be similar to what famous actors and actresses of today do when they impress their hands in wet concrete in front of what was formerly the Grauman's (Grumman's) Chinese Theatre in Hollywood. Another Meaning of the Chinese Character for "Star"
According to old Chinese texts, the Chinese character for "star" (xing 星) not only referred to the lights in the night sky but also had the meaning of 布 (bu) which meant to spread or disseminate. Other ancient texts gave the meaning of star as 散 (san) which had the similar meaning to distribute or to give out. Coins, as a form of money, represent power and the ancient Chinese believed the key function of a coin was to be distributed or circulated. The implied meaning of the star symbol, therefore, is that Chinese coins should be like the star-studded sky, widespread, numerous and distributed throughout the world. There is a less well-known theory for the appearance of these star, moon, cloud and dragon symbols specifically on old Chinese coins. I find this theory more convincing because it is consistent with the philosophy and religious beliefs that existed in China at the time. The ancient Chinese relied on Yin Yang (阴阳) and the Five Elements (wu xing 五行) to explain all that was on earth and the structure of the universe. They believed that all of nature consisted of these Five Elements, namely metal (jin 金), wood (mu 木), water (shui 水), fire (huo 火) and earth (tu 土). To continue our examination for the appearance of moons, clouds and dragons on old Chinese coins, we need to look more closely at the meaning of the element water (shui 水). Just as the Chinese character for "star" (xing 星) had a second meaning of spreading out, the Chinese character for "spring" (quan 泉), as in a source of water issuing from the ground, had another meaning. In ancient times this Chinese character referred to a coin! Going further with the analogy of water, the old texts explained that the moon (yue 月) was a messenger or envoy from the heavens. Water was the accumulated cold air of the Yin (阴) and these vapors originated with the moon. The moon was the essence of water and was the spirit in charge of water. Therefore, the extended meaning of a "moon" on ancient Chinese coins was that money should circulate just like the flowing, gushing and rising waters. The use of "clouds" (yun 云), sometimes referred to as "auspicious clouds" (xiangyun 祥云), is also tied to the water element. The ancient Chinese texts state that clouds are rain water. The master of the clouds is also the master of rain (yu 雨). The Book of Changes or I Ching (please see The Book of Changes and Bagua Charms) states that the second of the bagua (八卦) is kan (坎), which is water, and that it exists in the heavens as clouds. The extended meaning of clouds is thus consistent with the reference to the moon in that money should freely circulate like flowing water. Finally, in regard to dragons (long 龙), the ancient texts state that the dragon is a water animal and that it is the dragon that sends the rain. The dragon was believed to exhale the wind and summon the rain. It was the spirit that was the master of water. The symbol of dragons would eventually evolve to refer to the emperor and the power of the central government. But, in its earliest depictions on Chinese coins and charms, the wiggly-line symbol of the dragon was yet another reference to the ancient belief that coins are meant to circulate freely like stars and water. The appearance of the star, moon, cloud and dragon symbols on ancient Chinese coins and charms did not happen by accident. Their appearance was a manifestation of the fundamental belief of the Chinese of the time in Yin Yang and the Five Elements. If you are interested in more information concerning symbols on Chinese charms, please see the comprehensive list of symbols with explanation of their meanings at Chinese Charms -- Hidden Meaning of Symbols.